Indiana advanced to the second round of the National Invitation Tournament with an 89-72 win over Saint Francis (Pa.) on Tuesday night at Simon Skjodt Assembly Hall. 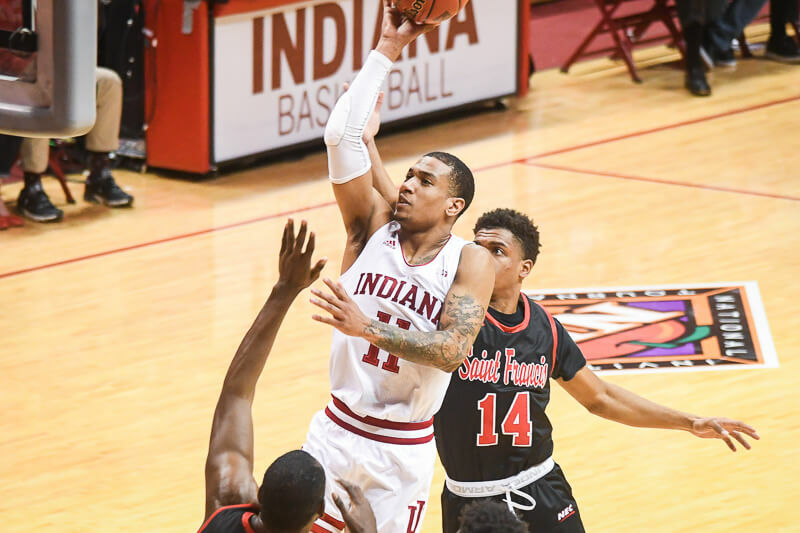 · As expected, Indiana starts slow: While teams around the country can say the right things publicly about being excited about playing in the NIT, the reality is that the event’s highest seeded teams often struggle. In the last three years of the NIT, only one No. 1 seed has advanced to the semifinals in New York City. On Tuesday, Indiana looked like a team that was only half interested in playing in the first half. The Hoosiers had poor closeouts on shooters and settled for perimeter shots too early in possessions. In the end, it didn’t matter that the Hoosiers had a poor first half. Indiana was the more talented team and pulled away easily on the strength of 55 points after intermission. · Morgan asserts himself: With Romeo Langford unavailable due to a back injury, Indiana relied heavily on Juwan Morgan for production on Tuesday. And the senior forward delivered. The Waynesville (Mo.) product scored a game-high 28 points, the third highest ever for an Indiana player in the NIT. Morgan is now the 27th on the program’s all-time scoring list and can break into the top 25 if he scores 19 points on Saturday against Arkansas. · Hoosiers return to late season form with just seven turnovers: Turnovers were a major problem in Indiana’s Big Ten tournament loss to Ohio State, but the Hoosiers returned to their late season form of strong ball security on Tuesday. Indiana’s turnover percentage of just 9.6 on Tuesday was its second lowest of the season, just behind the regular season home finale against Rutgers (8.6). For the season, Indiana’s turnover percentage now sits at just 18, which ranks 137th nationally according to KenPom.com. · Durham hits double figures for first time in March: Sophomore guard Al Durham Jr. hadn’t reached double figures in scoring in four prior games in March, but broke out in a major way on Tuesday. Saint Francis (Pa.) had no answer for Durham as he hit six of his eight 2-point field goal attempts and also splashed in a trio of 3-pointers. Durham, who will be even more pivotal for the program next season as an upperclassmen, finished with a career-high 22 points. · Small crowd, but solid atmosphere at Simon Skjodt Assembly Hall: The published attendance of 5,431 for Tuesday’s game is the lowest since IU’s 2005 NIT contest against Vanderbilt, but those in attendance were enthusiastic throughout. With $20 tickets and free parking, hosting the NIT marked an opportunity for fans who may not have otherwise had an opportunity to see a game to do so. Moving forward, it will be interesting to see how the fanbase embraces the event. The Hoosiers are scheduled to play a Saturday afternoon game against Arkansas in the second round, a time slot that coincides with Little 500 quals, the NCAA tournament and the IHSAA state finals.